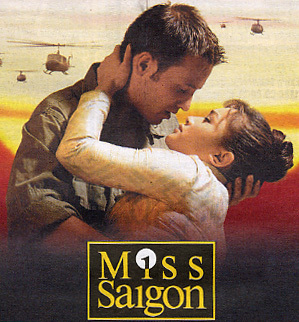 “Miss Saigon” is a musical that is currently on tour in the Theatre Under the Stars. It is the 10th longest running Broadway musical, and Schönberg and Boubil‘s 2nd biggest hit after Les Miserables, so you have to give it props for that. It also made very good use of themes, with each character and story line having recognizable melodies that recurred through out the production. The flip side of this is that there were no really strong, memorable songs that stood out. I think that the most interesting song/dance number was “The Morning of the Dragon”, in the way it wove several different themes and melodies together, as well as the way the dancing moved the story along. The characters serviced the story well, but the two “main” characters, Chris (the Marine) and Kim (“Miss Saigon”) were strangely one dimensional and did not really do anything interesting or unexpected in the story. The most memorable character was that of the Engineer (played by Joseph Anthony Foronda), who’s “The American Dream” piece is the best Gratuitous Self-Indulgent Dance Sequence ever performed. He is also the character in the most songs and scenes, and the producers themselves seemed slightly confused to his importance in the musical. He received top billing in the cast list, and was the last person to run on during Curtain Call, and initiated the bows, usually reserved for the lead role, even though the Engineer is an only an observer of the plot, not really furthering it in any notable way. The most complex character would have to be Ellen, Chris’ American wife, who wants to do the right thing but admits “when it comes down to her or me, I’ll fight!” She only has about 15 minutes of stage time, but she really makes the most of those 15 minutes, so massive props to her. All in all, I’d say that this was a good musical, with many very good moments, but never really crosses over into great.